Tornado’s Edge® is a skate training innovation that rapidly accelerates an individual’s ability to learn new skills. It was developed to be an on-ice support trainer that is easy for coaches to incorporate into a training plan. The video below is one of the best documented progressions we have on file. This transformation is typical when the instruction is performed by an experienced trainer. Did a three minute treatment just change an evaluation ranking? We think it did!! The trainer was designed as an aid that gives continuous repetition with upright success (sometimes referred to as muscle memory) in a skating development environment. From a individual perspective, the benefit appears as confidence. When the innovation was being developed, there were several intended and unintended benefits that resulted. 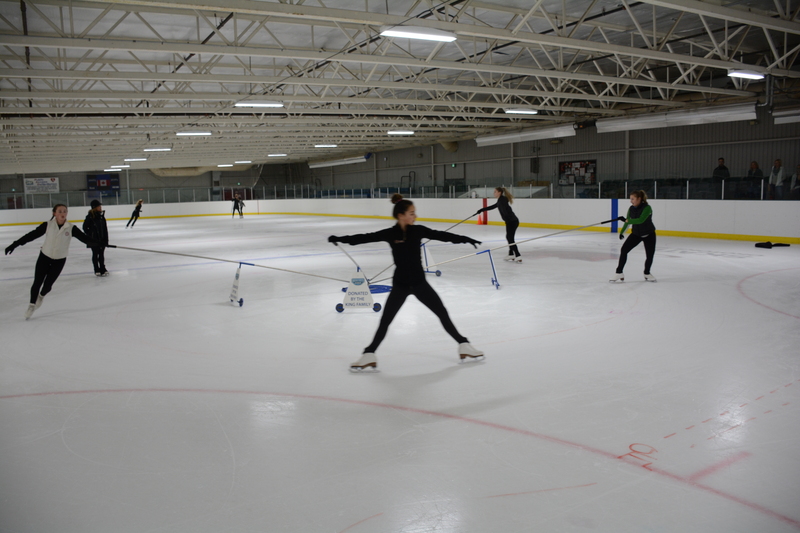 The advantage of the trainer for an advanced skater is the ability to practice that next skill. A drill like “shoot the duck” can be practiced in a less intimidating process. The video below shows the range of the training aid. If you ask a child to kick a soccer ball, they will achieve instant success as their foot moves the ball. When you take a child, raise their center of gravity, reduce their footprint to a 1-4mm edge, and put them on a hard slippery surface, initial results are quite predictably problematic. We expect them to go have fun on a 200’ sea of scariness. Over time, children will eventually achieve success. However, some will not continue skating because they will not have had the best experience. Children’s motor skills advance when they achieve repeated successes. Confidence is everything when a child decides when they can walk, ride a bike, and skate. Examples of training aids exist in the form of training wheels, water wings, and t-ball. Now there is a new option for skating. We believe everyone deserves the opportunity to skate. One of the unique strengths of our trainer is how all individuals can increase their abilities. From kids that are too afraid to be on the ice to advanced edge development. How can a device help such a wide range of individuals? It boils down to the stress generated by fear. When an individual is in a highly stressful state, deep learning is very limited or impossible. Our brain is in a “get me out of danger” mode. The next time you are being chased by a bear, try learning multiplication tables! Although the example is extreme, it puts some perspective on the problem. In any group of skaters, fear can vary considerably. By providing a predicable risk free environment, deep learning is enabled. It is in this state that abilities get formalized in the brain. For an anxiety prone first time skater, this can make a massive difference. Rather than just walking, they try to glide sooner when they feel supported. Once the confidence has been established, then trying off the trainer isn’t so scary. Skating requires some of the most complex motor skills and learning never stops. Fear returns as the skater is put into unfamiliar maneuvers. Once again, a predicable risk free platform helps learn that next challenge. Repeated successful iterations translates the new skill into an accomplishment. To the observer, the skater has increased “muscle memory” and “confidence”. The learning opportunity on the trainer has a very wide footprint. That is why we believe the abilities of all levels of skaters can benefit. 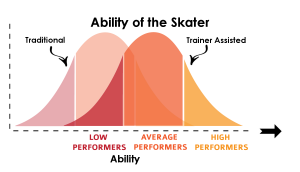 The trainer will effectively shift the curve of skating abilities by removing the fear barrier. We have learned that the real power of the trainer is how skills can be introduced 1-2 years sooner than traditional skate training methods. The skater can practice the skill with the support of the trainer. We see first time children able to do trainer assisted crossovers in a very short time. The motion is learned early. More advanced skills can be introduced and practiced on the trainer while they refine the skills they already know off the trainer. It allows the skater to be practicing a wider range of skills at any given time. In a process called interleaving, where multiple skills are done in a single drill, the Tornado trainer lets all skaters practice regardless of each ability. They end result is a child that accelerates their skill development. 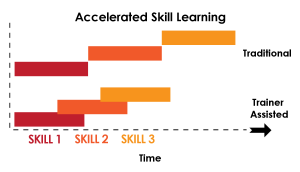 There is an element of how learning can be accelerated by making an activity fun. 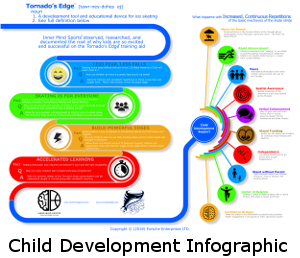 Children describe the Tornado’s Edge® as a merry-go-round or an amusement ride. Not only has a safe risk free environment been established, the fun factor has just put learning into overdrive. The kids see the new things they can do and they don’t realize it would have been an uncomfortable experience in the past. They are performing skills the pros do! The consistent response from kids is that the trainer was the best part of the practice. During our first year of development, we struggled to explain why skaters of all ages and abilities were experiencing instant success on our innovation. There was something special that was happening. It seemed like a combination of fun and confidence that was making a real difference. We received our answers from Lorie Pulliam from Inner Mind Sports®. When she first witnessed the trainer on the ice, her response was “You have no idea what you have invented!”. She was referring to some of the fundamental elements that help a child accelerate the learning of a new skill. Since our meeting, Lorie has helped us with research and a study (Study Infographic) explaining some of the advantages our training aid gives to children. This has helps us understand the importance of child development. It has also allowed us to always validate our program development against proven knowns in the child development realm.That is how the power of fun further accelerates learning. We are taking orders/inquiries via the form Sales/Inquiry Request. We are currently selling the units however we are considering leasing options to make the costs an operating expense. We will consider adjusting price points for multi trainer purchases and potentially for a “first in” for a new geographic region. The delivery schedule for the 2018/2019 season is expected to be very busy. We can typically deliver at a maximum of 4 weeks if no inventory is available. We do carry extra inventory for the fall push. Because the trainer is such a new concept, the adoption is unpredictable. The best way to ensure delivery is to secure a unit(s) with a deposit. The following list have between 1 – 4 trainers at each location. We were fortunate enough to catch the attention of the Calgary Flames organization. They felt the trainer will help kids improve skating skills. They decided to help minor hockey associations in Alberta with a pilot. The pilot ran in the 2017/2018 season. The decision has allowed several associations and thousands of kids to have access to the Tornado’s Edge trainers. We do understand that typical clubs and associations do not have unlimited financial resources. There are a few options to get the Tornado’s Edge in place for the kids. We have moved to a leasing strategy to make the cost easier for a club or association to be distributed among member fees. Depending on the size of the membership, the price per child can be as low as $10-20 annually. We have several examples of full donations of trainers to clubs and associations. The trainer was designed with advertising as a potential revenue stream for the association. We see this as a real option for smaller communities. We have not seen a go fund me for Tornado’s Edge yet. However, parents and grandparents can get quite excited to see their children on the merry-go-round. We can work with you to get top contributors to be on one of our placards. Contact us and we can discuss how we can support a campaign with pictures and videos. We have seen hockey associations apply for grants to subsidize the trainer acquisition. The trainer is no different than a playground equipment purchase. When possible, we are available to bring the trainer for an on ice demonstration for an association. We typically show the trainer for 30 minutes with 4-8 of your children at various skill levels. We follow that with 20-30 minutes of discussion for any questions. The demonstration will be kept to a drill plan we have unless there is a request for a specific drill prior to the demonstration. The Tornado’s Edge™ trainer gives physical support to skaters of all ages to strengthen confidence with controlled repetition learning (muscle memory). 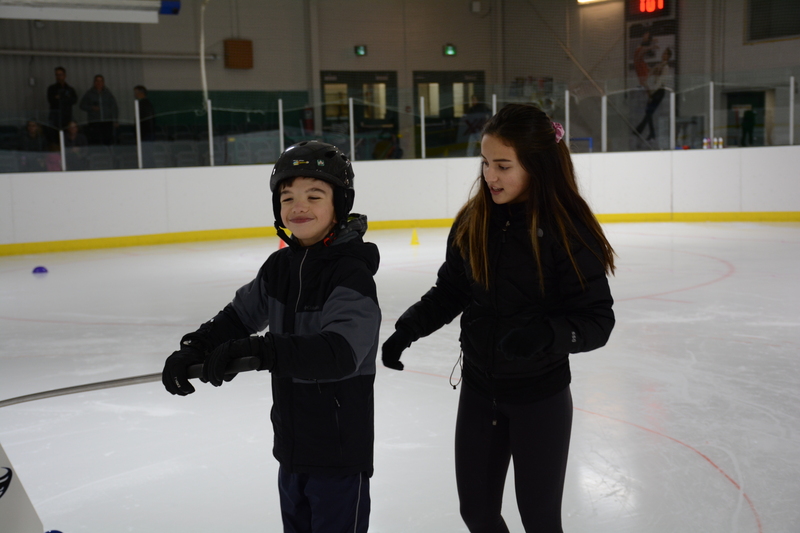 It allows young skaters to practice the difficult task of learning how crossovers are accomplished. More advanced skating edge techniques can also be refined with the support of the trainer. Applications of the device seem to expand all the time. When adults use the device, they benefit from the support because falling can be much more dangerous as age increases. Individuals with physical or visual disabilities can also expand their activity potential with the Tornado’s Edge™. The trainer is the brainchild of Derek Fortier and Gerard Beaulieu of Forsche Enterprises LTD. The product was developed and tested in minor hockey environments. Derek, who is a minor hockey coach, conceived of the idea when he was helping his sons with skating technique. Coaches and players alike get very excited when they see the trainer in action. The first question is “How do we get this in our practice?”. If you are interested in sponsoring a team with a trainer, please Contact Us. As a Skills and Skating Coach for 25 years in the US and Canada Tornado's Edge is a GAME Changer. If you are a Skating Coach or Skating Director you should make every effort to get a unit to your Rink..Beaudin Hockey Player Development . Contact Derek Fortier and his team for more details. If you are looking for a great program, check out Kootenays Edge!! !